It’s almost time for one of this summer’s biggest poker festivals. The Super Millions Poker Open (formerly the Summer Millions) starts July 15th. There will be over 100 tournaments on the SMPO calendar. This is up from 70-plus tournaments we had in 2016. The guaranteed prize pool has been bumped up from $2.3 million to $2.5 million. Judging by how popular last year’s SMPO was, many of these tournaments will double, triple or even quadruple their guarantees. Play poker at Ignition Casino and get $2,000 in Welcome Bonuses. You don’t have to wait to lock down your seat at the Super Millions. Qualifiers start Thursday, June 29. This gives you multiple ways to get into the SMPO at a fraction of the cost. Talk about a great way to secure a place in the Main Event. The Main Event has $300,000 guaranteed up for grabs at a regular buy-in of $450. Whatever your bankroll or experience level is there’s a tournament for you at this year’s Super Millions. Qualifiers will start as little as 55 cents. At this price there is no excuse not to try to qualify. If you’ve been looking for a way to play the Main Event on August 13 this is it. Qualify and win a piece of that $300,000 guaranteed minimum prize-money. Start firing up those satellites, and we’ll see you at the SMPO tables. Super Millions Poker Open 2017 is on! Get ready to take your cut of $2.5 million in guaranteed cash prizes. Official SMPO events are set to launch on July 15. All roads leading to the $300,000 Main Event on August 13. There are over 100 events on offer throughout the series, with buy-ins ranging from $5.50 to $450, or win your way into an official SMPO event with qualifiers starting June 29 from as little as $0.50 + $0.05. This year’s SMPO has something for everyone, so gear up for one of the most anticipated poker series of the year and secure your seat at a table today. Qualifying for the Super Millions Poker Open is easy. No matter whatever your preferred game or stake. You’ll be able to find all available qualifiers in the poker software. 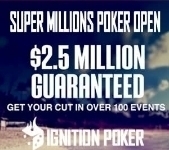 Play poker at Ignition Casino in the Super Millions Poker Open. Previous: MLB Odds: Can Strasburg Keep Cool Versus Cubs?